This happened only once in my testing so far today (dozens of boots). I'm attaching the console log of failed instance. The instance that reported this bug is same ami/region different instance. I seem to be seeing this more and more. I've seen similar traces in the t1.micro logs without crash. Moving it to medium. 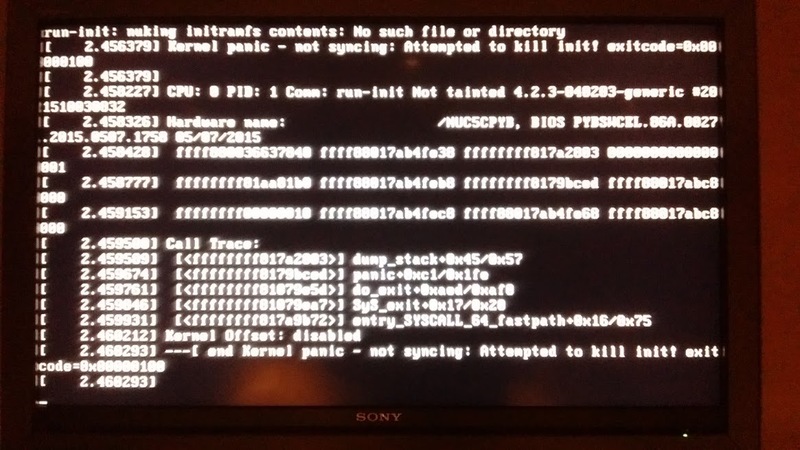 The kernel panic is a result of init exiting, which likely isn't a kernel issue. From the logs it looks like run-init is bailing because it can't delete something in the initramfs when switching to the real root fs. I think this is more likely an initramfs issue than a kernel issue. Adding initramfs-tools to the affected packages. This problem seemed to have intensified for me in my test system in Oneiric and we were finally able to track it down to /usr/share/initramfs-tools/scripts/init-bottom/udev. In there the boot process tries to stop udevd and then move all the special filesystems (/dev, /proc, and /sys) over to the new rootfs and finally switching to that before restarting udevd. However udevd is still launching processes to create devnodes at that point. And it seems in some rare cases the pkill (SIGTERM) fails to really kill all of the udevd processes, which leads to situation were the initramfs cannot be completely nuked and that triggers a panic. In Oneiric udevadm has a way to stop udevd in a more sensible way which also waits until udev actually stopped (udevadm control --exit). Thought this is not possible with the versions of udev in Natty and Maverick. Making udevd at least not starting new processes (udevadm control --stop-exec-queue). Using that before the pkill would prevent a lot of those ugly "workers have been killed" and "/dev/null not found" messages. Unfortunately there still seemed to be a (much smaller) chance to hit the problem where udevd does not stop on SIGTERM. So I am not sure which path is the better / simpler to implement one. Have the ability of using a --exit backported from newer udev packages or possibly retry the pkill a few times and if that does not remove the udev processes, switch to a more brutal signal before finally giving up... But either way it is not a kernel problem but udev or initramfs-tools side. This has been fixed for Oneiric by udev-171-0ubuntu4. Though it is part of /usr/share/initramfs-tools, the scripts/init-bottom/udev is part of the udev package. @Stefan: this also affects Lucid. Is it going to get the fix also? Bugs 573615, 581566 and 155689 also describe similar symptoms. We sporadically also see similar symptoms to this bug and #610107. I think they're also connected and both caused by killing udev in the middle of its operation. The huge number of similar bugs makes me think this is not the best idea even when it gives us 2 or 3 seconds less of boot time. Wouldn't simply adding "/sbin/udevadm settle" before killing udev solve this issue? We're currently starting long-term tests to see whether it helps. On my laptop, it's now reproducible on *every* boot! instead of I now get a couple of steps further and then the system kernel panics with this exact message. Every time. [ 1.172059] Refined TSC clocksource calibration: 3411.530 MHz. [ 6.334837] Kernel panic - not syncing: Attempted to kill init! [ 6.397128] Kernel panic - not syncing: Attempted to kill init! [ 6.357963] Kernel panic - not syncing: Attempted to kill init! Someone with the necessary privileges should update the summary: this bug really doesn't have anything to do with the ec2 kernel, nor with system_call_fastpath. "run-init: nuking initramfs contents: directory not empty" seems more appropriate. I agree Bernie, so I changed the title. I don't believe you need particular privileges to do this. Please can someone register this as also affecting "udev (Ubuntu Lucid)". I have tried, but cannot find a method to do this. Please, can someone register this as also affecting "udev (Ubuntu Lucid)"? My case resolved: somehow during upgrade I got /run as symlink to /var/run and /var/run as symlink to /run. After I patched this, the problem is gone. But it took time to spot it. Regarding bug title: I find this error message to be not too informative… Providing some detail about the problem (which directory is not empty and what it contains, for example) woudl make resolving problems much easier. Reproduce this trouble after upgrade from lucid to precise. Remove simlink /run and make dir /run in guest - fix problem. I’m really inexperienced on Ubuntu 10—just wanted to note this here in case it helps anyone. As already mentioned in comment 10, we experienced the same bug at the end of 2011 and were hit by it in internal tests every few weeks. After applying the mentioned change, it disappeared. Since somewhen in 2012, we're in the field with about hundred systems running Lucid with this patch and never ever saw the problem again. So probably applying the change to Lucid-updates would make sense? To make it easy for you, I also added our patch now. I have been having this problem (intermittently) with Ubuntu Server 15.04 and now with 15.10 on my Intel NUC5CPYH for the last 3 months (since I bought it in fact). It only seems to happen when rebooting (never from a cold boot), and it doesn't always happen. I've attached an image of the console output. As my machine is normally headless it is particularly frustrating! I use LVM but not for the root/system partition, only for /home. My system/root is at /dev/sda1 and formatted with ext4. I am using latest kernels downloaded from Ubuntu's http://kernel.ubuntu.com/~kernel-ppa/mainline/ (currently 4.2.5) - but as discussed here it doesn't seem to be a kernel issue.